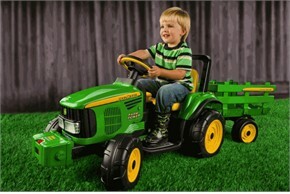 The Peg Perego Battery-Powered John Deere Tractor Ride-On gives little ones a big chance to help out with farm chores. Perfect for kids ages 3-7, this John Deere battery-powered tractor is great for picking up sticks & materials and hauling them away. Farmers-in-training will love the easy-to-use foot pedal accelerator, automatic brakes, and dual rear wheels. Plus, this tractor ride-on for kids operates at two speeds: 2 ¼ or 4 ½ mph -- in reverse, too! To ensure safety, the 4 ½ mph setting has a handy lockout feature that parents will appreciate. A 12–volt rechargeable battery and charger are both included. Made in the USA in our Fort Wayne IN Factory using domestic and global components. Dimensions: 25" x 24.75" x 65"
Availability: This John Deere Tractor Ride-On takes approximately 2 business days to leave the warehouse plus transit time. Please Note: This item ships ground ONLY and does not ship express or to Alaska, Hawaii, PO Boxes or APO addresses.